I mentioned previously that two artists have been in my top 10 records three years in a row – Josh Rouse and M. Ward. These two artists are operating at a creative level that few artists obtain. They are putting out great record after great record, year after year. 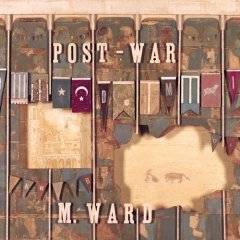 M. Ward makes my favorite kind of music; inspired, unique, intense, beautiful, guitar driven folk rock. He plays guitar with the best of them and he can play any style and does it brilliantly. It moves from melancholy to upbeat and back again for twelve wonderful songs, each one perfectly timed. The song that makes the record for me is Requiem, an obituary for a man who “was a good man and now he’s gone”. The guitar solo in the middle of the song is classic M. Ward. And so it is. You should give it a try.